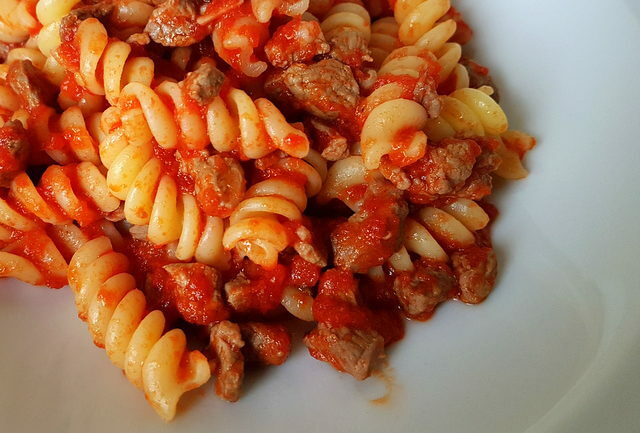 Fusilli Pasta with Lamb Ragu from Molise. 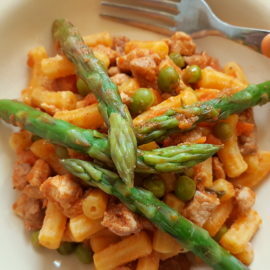 Fusilli al ragu di agnello. 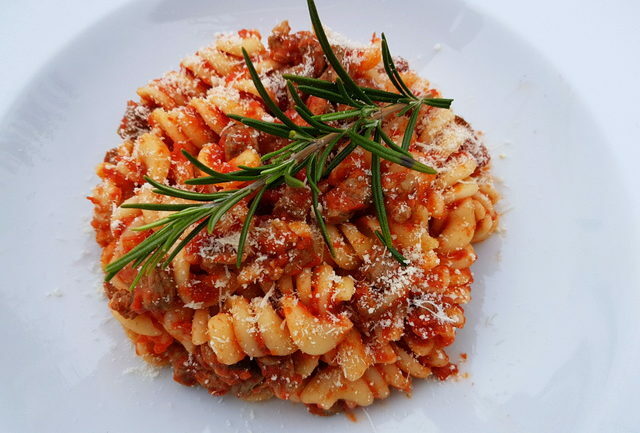 Pasta with lamb ragu is very popular in Southern Italy. 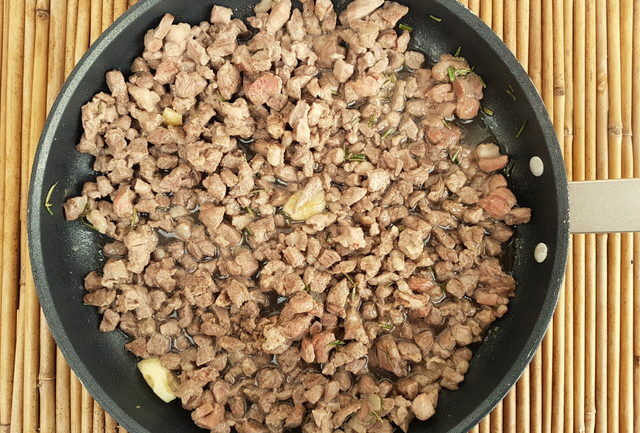 Interestingly, here in Veneto, lamb is hardly ever eaten and the only cuts that can regularly be found in butchers and supermarkets is lamb chops or cutlets. Although the Venetians do eat lamb at Easter and then there’s more available to buy. Being a Brit, I love lamb and miss my roast lamb on a Sunday or a good lamb curry, although the latter I sometime make with neck chops. 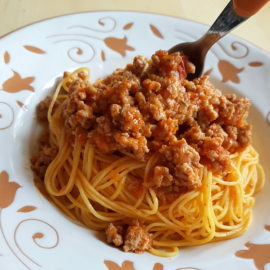 In fact, I used neck chops to make this ragu and I have to say it turned out absolutely delicious. So, I’ll most definitely be repeating it! This particular recipe for pasta with lamb ragu comes from Molise, a region on Italy’s Adriatic coast between Puglia and Abruzzo , to which it belonged until 1963 when it became a separate region. Molise has a small population and is Italy’s second smallest region after the Val d’Aosta. 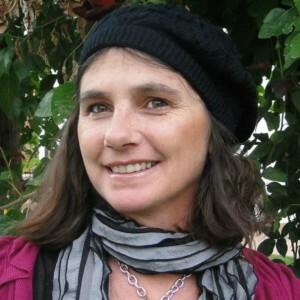 Here there’s lots of unspoiled land and mountainscapes and little industry. And many of the Molise population live off the land raising livestock such as pigs, cows and sheep. This is why lamb is a popular ingredient in the Molise kitchen. Traditional pasta with lamb ragu. 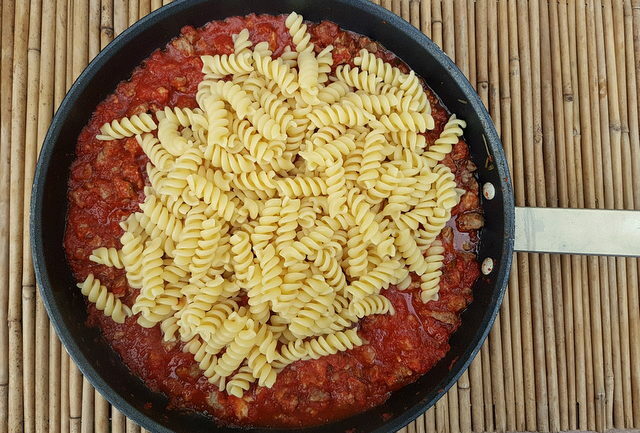 This ragu is traditionally served with homemade cavatelli , a pasta called crioli (which is similar to homemade spaghetti alla chitarra from neighbouring Abruzzo) or fusilli. 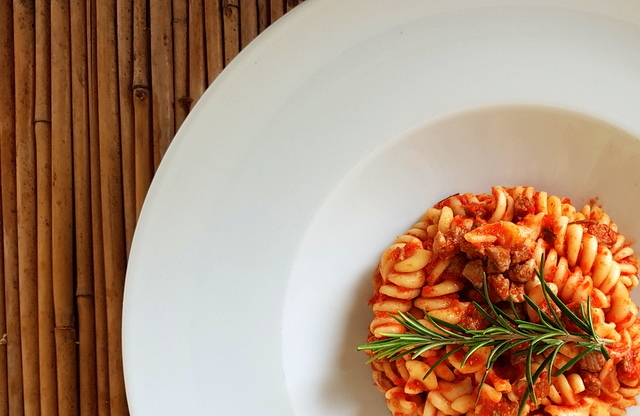 Not many know that fusilli is a pasta shape which originated in Molise. Normally made with durum wheat flour, water and a pinch of salt, homemade fusilli are created by twirling pieces of pasta dough around a wire and then leaving them to dry. In some cases eggs are also added to the dough. 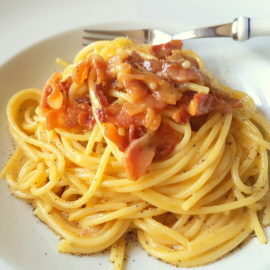 Although I didn’t make homemade pasta for this dish, I used fusilli from a pasta maker in Molise called ‘La Molisana’. This company is Italy’s fifth largest pasta maker and is located at the foot of Mount Matese in Molise’s hinterland. Although La Molisana is a commercial pasta maker, they are considered by Italians to be one of the top 5 commercial pasta producers in Italy, in terms of quality and taste. 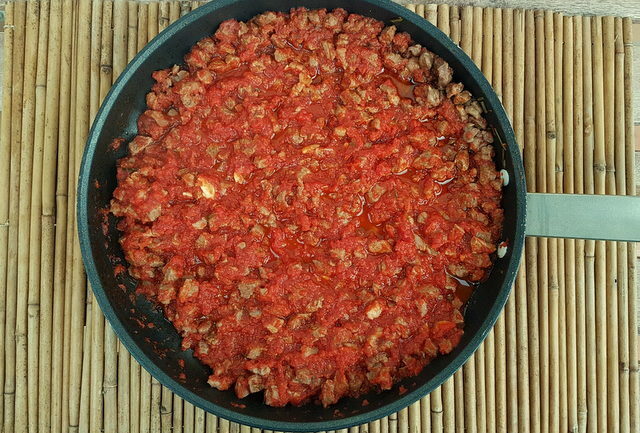 There are, of course, different types of lamb ragu in Molise and throughout Southern Italy. 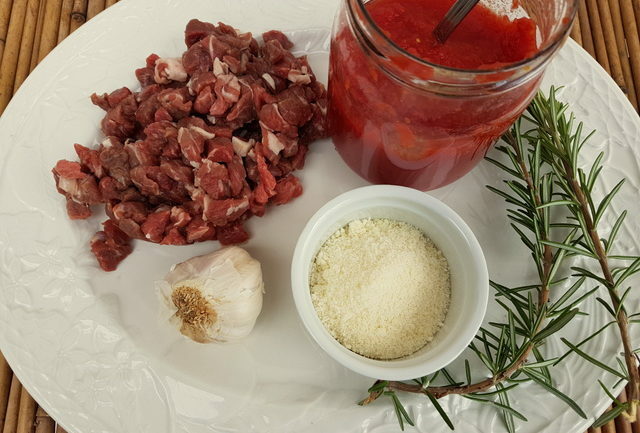 This is a very simple version which contains only lamb (small pieces not minced) tomato passata (I used homemade) or peeled fresh tomatoes, rosemary, garlic, red wine and seasoning. This sauce is really tasty. In fact, I think because there aren’t a lot of other ingredients, the flavour of the lamb really holds sway. The most important step in this recipe is that the sauce has to be simmered for at least an hour. I actually cooked it the day before eating and left it covered in the fridge. Doing this also gives the sauce a richer and fuller flavour and means you can prepare it a day in advance, which I love, especially when guests are coming. Who wants to be slaving in a hot kitchen whilst everyone else is enjoying their aperitif! You can also freeze leftover sauce or make enough to freeze a portion for a later day. Then all you have to do is cook the pasta! Two meals for the effort of one! If you make this recipe I’d love to hear how it turned out. 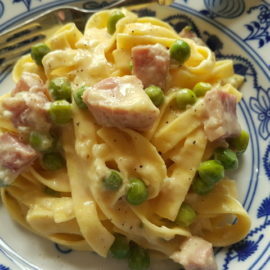 You can comment here on the blog at the bottom of the page or on The Pasta Project Facebook page.